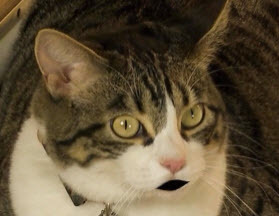 duffy's mouth Archives • A Talking Cat!?! Here it is, folks! The moment you’ve all been waiting for! Duffy, the talking cat from A Talking Cat!?! is finally going to talk!?! Are you ready for it? I don’t think you’re ready for it. Maybe if Tina talks to some unknown party on the phone for a bit, that will prepare your weak hearts and soft minds for the incredible revelation of a cat who can talk. During the course of Tina’s conversation, she says “I know” nine different times. Sounds like she’s married, AM I RIGHT FELLAS!?! Internet high five. While Tina is saying “I know” a bunch, Duffy thinks to himself that he either “really likes the look of [Tina’s] beeping machine” or “really like for [Tina] to look at your beeping machine.” It doesn’t really matter what he says in the same way that it doesn’t matter what someone says in their sleep. Remember, it’s always dangerous to wake Eric Roberts. And then, even though you had steadied yourself for it, you are consumed by the blackest black you have ever seen. Hopefully, you are watching A Talking Cat!?! on a plasma screen so you can really feel the depth of hell that is Duffy’s mouth. Duffy’s mouth is where dreams and wishes go to die. It’s less a mouth and more a rip in time and space. Something that threatens to consume the very structure of the universe we know. Eyes will melt. Atoms will be torn apart. Warranties will expire. Duffy’s mouth comes from an unknowable place and it’s best not to look directly at it. Also, if you’re looking for a band name, Duffy’s Mouth is pretty good. Tina is appropriately confused. A cat just talked. She has a lot of questions like “why” and “who” and “how.” Duffy rebuts her questions by continuing to insist she reads her beeping machine. We know this scene is ridiculous. But it’s even more ridiculous than you think. Scientifically speaking, a teenage girl is always 43.2 seconds away from looking at her computer. That’s a fact I just made up. So Tina is bound to look at her computer very soon. Duffy’s insistence that Tina looks at her computer is actually keeping Tina from looking at her computer. It’s like quantum physics. You’re changing the outcome by inserting yourself into it. In trying to help Tina, Duffy is actually doing more damage. Duffy is a horrible cat. Oh man, there is so much more scene to go over, and the only things that have really been said are “I know” and “read your beeping machine.” We’ll get to the logistics of a talking cat and more horrible Susan next time.